Marian "Gabby" Kneer has devoted her life to athletics and education. Now a resident of Western Springs, a Chicago suburb and a retired professor from the University of Illinois-Chicago, Kneer was called the "worldí's greatest softbaIl catcher" in the late 1940's. And for a long time, people didn't even know her first name, just calling her "Gabby" Kneer - maybe because of the way she continually chirped encouraging words to her teammates. A graduate of Woodruff High School and Illinois State University with a doctorate in physical education from the University of Michigan, Kneer was a tireless promoter of sports for girls in Illinois high schools, and was a co-founder and leader for permitting competitive interscholastic sports. Marian taught at East Peoria High School from 1949 until 1968, going from there to the University of Illinois-Chicago. She gave up sports to concentrate on her teaching career. Her sports honors included membership in the Illinois State University Athletic Hall of Fame, the Illinois Softball Hall of Fame, and Illinois Coaches Association for Girls and Women Hall of Fame. A catcher for ten years, her sports career also included basketball, field hockey, and coaching girl's basketball. 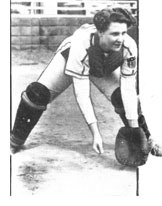 A .323 lifetime hitter, she caught for five state and three world championship teams as a member of the Caterpillar Dieselettes. Kneer played basketball locally for the Dieselettes and Gipps Brewery teams. Her professional experience includes numerous publications pertaining to physical education on the State, National, and International levels. She co-authored "Softball-Fast and Slow Pitch" with Chuck McCord, previous Hall of Fame Inductee - now in its fifth edition. Kneer served in every elective position of the Illinois Association for Health, Physical Education and Recreation as well as with the National Association for Sport and Physical Education. Currently a Professor Emeritous from the University of Illinois-Chicago, she is a consultant for Physical Education..